› Author Affiliations Funding This work was supported by the Agency for Healthcare Research and Quality (R01HS21816, PI: Vawdrey), the National Library of Medicine (T15LM007079), and the National Institute of Nursing Research (K99NR016275, PI: Masterson Creber). Background Disadvantaged populations, including minorities and the elderly, use patient portals less often than relatively more advantaged populations. Limited access to and experience with technology contribute to these disparities. Free access to devices, the Internet, and technical assistance may eliminate disparities in portal use. Objective To examine predictors of frequent versus infrequent portal use among hospitalized patients who received free access to an iPad, the Internet, and technical assistance. 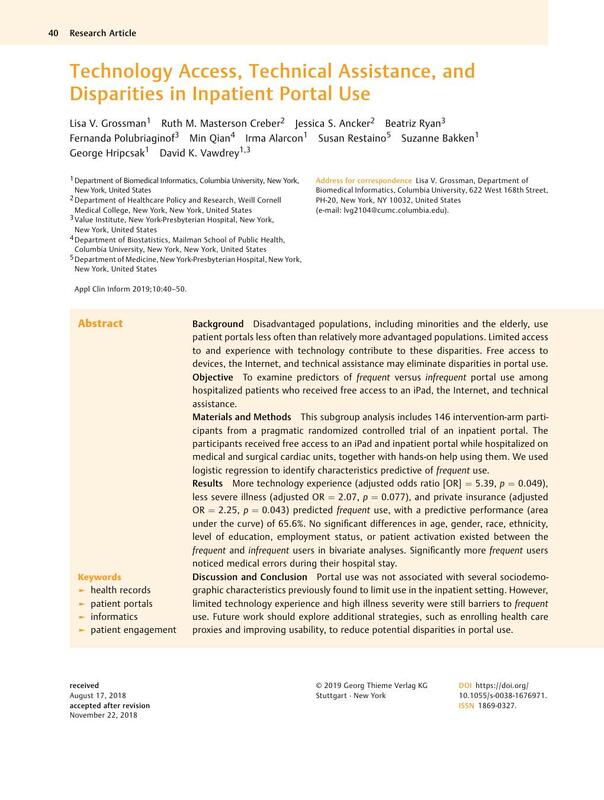 Materials and Methods This subgroup analysis includes 146 intervention-arm participants from a pragmatic randomized controlled trial of an inpatient portal. The participants received free access to an iPad and inpatient portal while hospitalized on medical and surgical cardiac units, together with hands-on help using them. We used logistic regression to identify characteristics predictive of frequent use. Results More technology experience (adjusted odds ratio [OR] = 5.39, p = 0.049), less severe illness (adjusted OR = 2.07, p = 0.077), and private insurance (adjusted OR = 2.25, p = 0.043) predicted frequent use, with a predictive performance (area under the curve) of 65.6%. No significant differences in age, gender, race, ethnicity, level of education, employment status, or patient activation existed between the frequent and infrequent users in bivariate analyses. Significantly more frequent users noticed medical errors during their hospital stay. Discussion and Conclusion Portal use was not associated with several sociodemographic characteristics previously found to limit use in the inpatient setting. However, limited technology experience and high illness severity were still barriers to frequent use. Future work should explore additional strategies, such as enrolling health care proxies and improving usability, to reduce potential disparities in portal use. This study was performed in compliance with the World Medical Association Declaration of Helsinki on Ethical Principles for Medical Research Involving Human Subjects, and was reviewed by the Columbia University Medical Center Institutional Review Board.